Show Me a Story: 40 Craft Projects and Activities to Spark Children's Storytelling by Emily K. Neuburger is a guide to creative exercises you can do with a child to make up stories. Children love to make up stories with their toys, friends and in play. This book helps make a regular and thoughtful pattern of it. While it's meant for adults to do with children, a lot of the activities will work with children of all ages. The craft projects include cards, decorated rocks to work as figures, small paper puppets and creating small scenes. One of my favorite things in the book is the number of projects that are portable so you can make up stories on long car trips or any place else you might have to sit quietly. My favorite projects are very interactive, and use storytelling prompts like decorated dice. It turns storytelling into a fun game and conversation starter. Also the part about exploring with a camera and a notebook to collect things to turn into a story is a very good one. 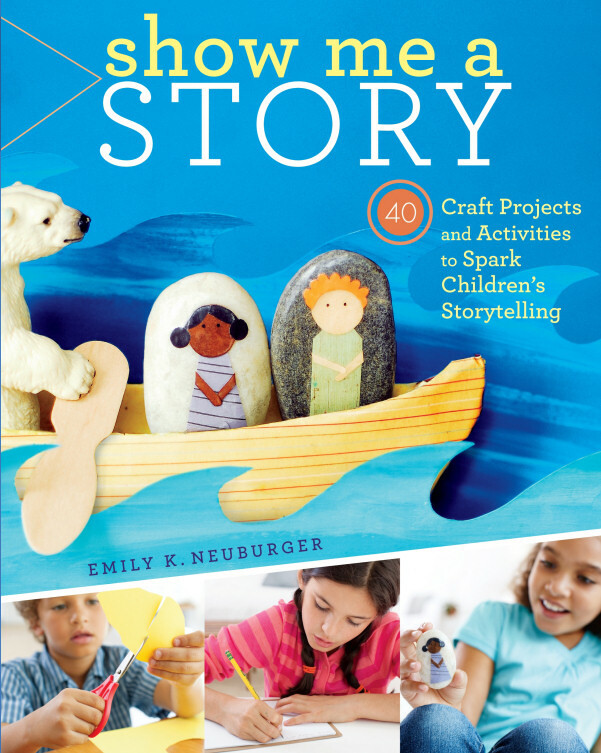 The author also talks about the basic structure of a good story, having a beginning, middle and end, and ways to help develop that part of a story. They are easy projects, they don't require that you have to be an artist to do them. The author has taught creative writing and used some of these techniques with high school students. While it's aimed for children, the writing prompts and exercises will also work with adults, and can be used as a great problem solving tool or communication tool. My family has been putting some of these ideas into practice and it is a lot of fun for the whole family. The book is well-written with clear language and ideas. It's one that I don't just recommend to parents and people who take care of small children, because a lot of the exercises will work well with tweens and young adults. I also think (hope!) the tips in here will make me a better blogger. Emily K. Neuburger's blog is red bird crafts.